is the CEO of The Philosophy Foundation, president of SOPHIA and a Visiting Research Associate at King’s College London. His most recent book is 40 Lessons To Get Children Thinking: Philosophical Thought Adventures Across The Curriculum (2015). ‘No, because she just sat there,’ says the first speaker, in answer to the first of these two questions. ‘We’re all time travellers!’ says another. ‘Everything’s a time machine,’ someone else announces later. And when asked to say more about this, adds: ‘Because everything is moving into the future one second at a time.’ I have seen two students respond to this point in the same way on two separate occasions: ‘I’m travelling through time one second at a time, but if I stand up…’ [student stands up] ‘…I’m still travelling through time, so the chair isn’t a time machine; it’s not making me travel through time.’ Elegant. This is an extract from a genuine philosophical dialogue. There are many examples of dialogue in the history of ideas. Consider the obvious examples first: Socrates’s discourses in the agora, Plato’s, Hume’s and Berkeley’s dialogues; the dialogues between philosophers by correspondence: Leibniz and Newton, Descartes and Hobbes; there are the dialogues between books such as those between Descartes’s work (Discourse, Meditations) and Spinoza’s (Emendation or Ethics), or Rawls’s A Theory of Justice and Nozick’s Anarchy, State and Utopia; there’s the intellectual discourse of ideas, very much in the Hegelian dialectical model, such as that between Thales (thesis: water), Heraclitus (antithesis: fire) and Empedocles (synthesis: water and fire); and again between Empedocles (thesis: earth, air, water and fire), Parmenides (antithesis: the one, not the many) and Democritus (synthesis: atoms, or the one and the many) and so on; there is also the often-overlooked dialogue-in-one-voice such as Descartes’s Meditations, or much of Wittgenstein’s writing (Wittgenstein is said to have stated that this is the only way to do philosophy; the moment others are involved it’s no longer philosophy but rhetoric). What makes the dialogue at the outset of this piece special is that it is one that I facilitated between nine- and ten-year-old boys and girls in a state primary school. The Ancient Greek philosopher Plato has the character Socrates apply the metaphor of dialogue to thought itself, what his Socrates called ‘silent dialogue’, in the Theaetetus. And it is well known that Plato wrote much of his philosophy in the form of dialogues, many of which focused on the main character Socrates (Plato’s teacher). By writing in dialogue form, Plato models to us – the readers – how philosophy is done, sometimes showing us how it’s done well and other times how it can be done poorly. In other words, Plato is demonstrating philosophical method and, arguably, not just one single method at that. Many will say that reading Plato is about learning and engaging with Plato’s theories and ideas about the big topics and questions of philosophy such as ‘the theory of forms’ (reality), ‘the theory of recollection’ (knowledge), ‘the tripartite soul’ (the self/psychology) and so on. That is how most university courses will treat Plato, but I think it misses the point. For example, the ‘theory of forms’ is a theory propounded by a character, Socrates, particularly in the dialogues in the Republic and the Phaedo. In the Parmenides dialogue Plato applies a fairly devastating critique of ‘the forms’ through another character, Parmenides, in conversation with Socrates, who is propounding and defending the theory. So, looked upon from this wider point-of-view, it is far from clear that the theory of forms is a theory Plato holds to and wants us to accept and learn; it appears that, through his characters, he is equally as critical. It’s also worth pointing out that all of the ideas attributed to Plato are expressed, not in his own ‘voice’, but through a character. I think that what Plato really wants us to do is to engage with the ideas and, following his model, enter into a dialectical relationship with the ideas presented to us through his written dialogues. In this way, Plato’s aims were pedagogical as well as philosophical. If we think that he simply wants us to ‘learn his theories’ we misunderstand him, but, much more than this, if we think that that’s what philosophy wants us to do, we misunderstand philosophy. When I do – or when anyone does – philosophy with children well, I am introducing them to philosophy as an activity, a process of thinking – I am introducing them to the act of philosophising. My question is: does this happen enough in philosophy departments? My experience at a ‘redbrick’ university – at that time the University of London – very much confirmed the bias towards teaching philosophy as the history of ideas, except in one context: that of the tutorial. In my day and at my institution, we had three students to a teacher for the first year, two-to-one for the second and one-on-one for the third. This is – lamentably – now a thing of the past. And, in my view, with it died a core feature of philosophical practice: the spontaneous, exploratory, philosophical conversation around a philosophical theme. I see this as so important I might call this the ‘voice of philosophy’. The tutorial has now been replaced with the seminar. I should prefix the next bit by saying that seminars are practised in many different ways in universities, but my experience of them was that they tended towards what Socrates called the eristic (eris = ‘strife’, so can be translated as combative) conversation, of which he accused the Sophists. 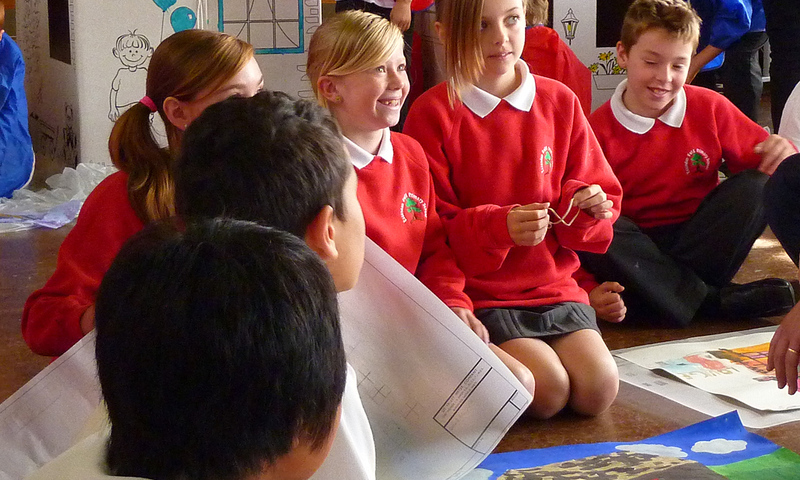 In primary schools, philosophy has been given its voice back. In fact, the only true way that children can properly ‘do’ philosophy is in this way. Apart from in a few, very exceptional cases, children cannot engage with philosophical texts, they cannot examine complex arguments made by professional and historical philosophers. But they can respond to simply-phrased, yet ‘deep’ questions such as ‘Is there a thought in this sentence?’, as well as respond to arguments made by their peers. For instance, in this case, one child may respond to the starting question (above) with, ‘Yes, there is a thought on the piece of paper because the word thought is on the piece of paper,’ and another child may respond to that with, ‘The word ‘thought’ is not a thought itself, because thoughts are in your head. It’s like the word ‘monkey’: it doesn’t jump off a page and climb up a tree,’ leading everyone to a discussion around the Socratic question, what exactly is a thought? And Where are they, if anywhere? A colleague of mine once said that it was possible to do three years of a philosophy degree and do no philosophy. His conception of philosophy was drawn from the Socratic tradition: to identify a genuine, real-life example that contained a conceptual problem and then to examine this, through dialogue, in order to discover whether or not example X is a genuine example of category Y. I consider this an extreme view of what constitutes philosophy – that it must be based in real life – but it does raise an interesting question vis-à-vis university philosophy. Depending on how centrally one places what I call ‘the voice of philosophy’, then it is certainly the case that one can go through a great deal of a module, a course – or even one’s degree programme – without engaging in an exploratory, spontaneous philosophical conversation. Yes, everyone does that in the pub or around the communal table in ‘halls’, but there is no systematic dialectical guidance in those situations. Then, towards the end of the session, carefully chosen reading material is set (which would usually be given and spelled out at the start of the class, or even before it). Crucially, and if the conversation is properly facilitated, it is very likely that the main theses of the reading material will have been, at the very least, touched upon by the group during their discussion (even if they are unfamiliar with the standard positions in the literature, such as ‘naïve realism’, ‘representative realism’ and ‘idealism’). My claim is that these ideas and debates will be more meaningful, better understood and easier to engage with, if the students contextualise them among their own thoughts and arguments. To do otherwise – as is all too often the case – is to put the historical cart before the philosophical horse.